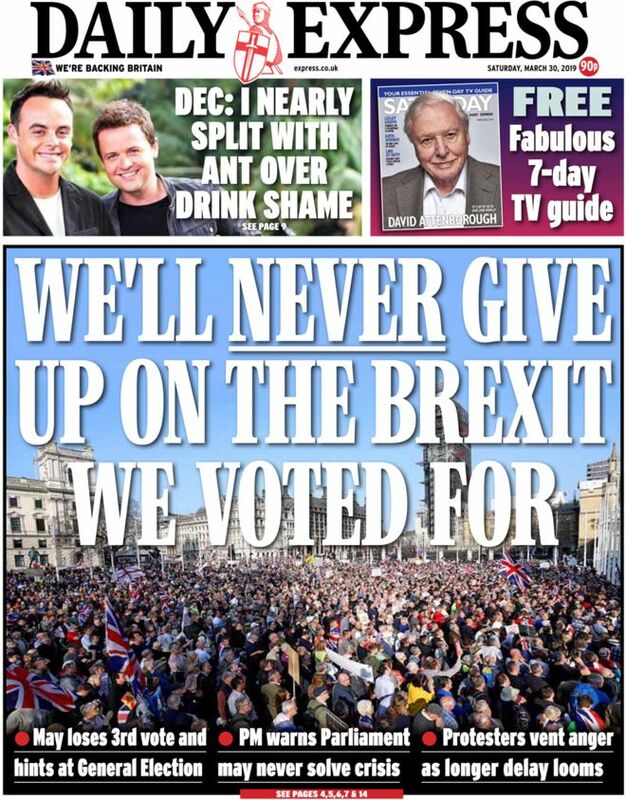 The newspapers mostly ignore yesterday’s Brexit rally outside Parliament. Thousands of Leave supporters gathered at Westminster on the day the UK was scheduled by law to leave the EU. But laws are made to be mangled in Parliament. Hours earlier 184 MPs had voted in favour of revoking Article 50. So we got very little. Only three newspapers lead with the crowds. The i (team: Remain) presents a picture of confrontation. There were five arrests for allegedly being: drunk and disorderly; wanted in connection with an offence in Hertfordshire; assaulting a police officer; assault (x2). “Brexit march,” says the Standard’s (Remain) headline, “five arrests as Leave supporters clash with police in Westminster.” Is five a lot? How many constitutes a rebellion? It’s enough for the paper’s main story on the protest. If you fear Leave voters and seek to portray them as the products of a Tommy Robinson dry toss, then five typifies the 17.4 million of us who to voted to leave in a free and fair vote approved by all MPs, the 184 anti-democrats included. In a liberal democracy, a free and open society needs tense debate and verbal conflict to survive. Suppression is wrong and foolish. Rational argument and public opinion are lifeblood. The vote is all most of us have to express out views. Reject the vote and give the intolerant a foothold. So those five arrests to breaching the limits of society’s tolerance. How do five arrests compare to the number of suspects pinched at the pro-Remain march staged last October? 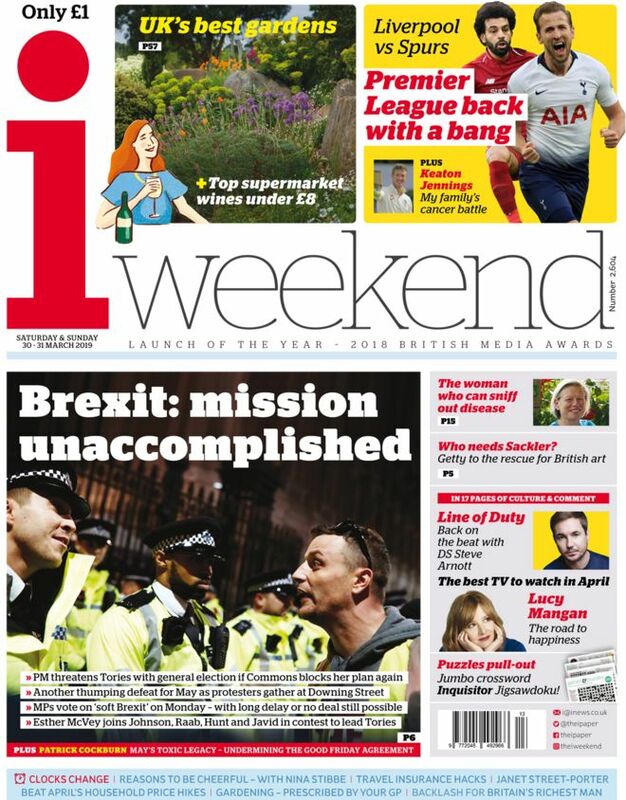 The Guardian told us at the very end of an article headlined “Huge crowd turns out in London to demand a ‘people’s vote’ on Brexit”: “A spokesperson for the Metropolitan police said they were not aware of any disorder nor were there any significant arrests.” Number? Dunno. But in July 2018, police arrested six anti-Trump protesters at a protest. Six might be significant. The Express (Leave) sees the people behaving peacefully. 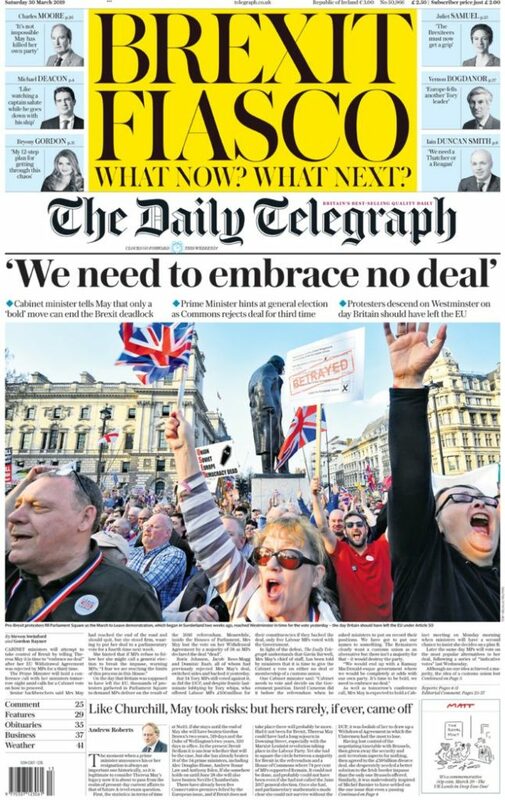 The Telegraph (Leave) evokes the spirit of Churchill. Last week, MPs rejected 8 alternative solutions for Brexit. They then rejected Theresa May’s deal for the third time. No arrests have been made. But we can agree on one: the country is split not because the EU inspires and destroys, rather because it’s so utterly mediocre, nebulous and dull. How bothered are you Britishers about staying in the EU: 50-50. Meh.